The whole East Coast of Koh Chang is still an undeveloped area. However it’s a “must see” for any tourist, everyone visiting Koh Chang at least spends one day exploring it. As a visitor it’s a very rewarding area to stay in if you are looking for a place away from the crowds, and some of the best value resorts of Koh Chang are on the East Coast. As usual we are not going to talk about the touristic features of the area but we are going to focus on the real estate & investment benefits of it. For general information about the area you can consult the tourist guides IamKohChang or ExploreKohChang. Just for you to know, the East Coast is probably the only place of Koh Chang where you can still find genuine thai style way of life : peaceful villages, unknown waterfalls, small hidden beaches, secret paths leading to panoramic amazing point of views, dozens of places not even on the tourist map of the island, real thai food, etc. Basically it’s the only area of the island where you could spend a day without meeting any tourist. Business wise and on an investing point of view it’s probably the best area of the island, because it’s the only place where you still can find lands for sale for a reasonable rate. Where can you find a 1 Rai Sea Front piece of land with Chanote for 5,000,000 Bahts ? 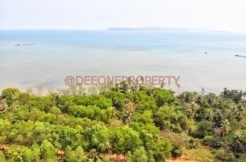 Where can you find huge lands with sea view still waiting for investors to purchase them ? Where can you find Chanote lands for less than 3M / Rai 100m from the sea ? Only on the East Coast of Koh Chang. You can see our whole list of lands for sale on the East Coast and Dan Mai zone with amazing opportunities. For a few months it has been developing quickly as some investors have been buying lands and starting housing development projects. Let’s say it frankly, in the coming 3 or 5 years the East Coast will know an unprecedented developing pace and the whole area will be transformed. It will not become a touristic heart of the island though, but more a residential high standing zone, with condominium, peaceful residential areas, and luxury spots. Finally, when the road will be completed all around Koh Chang and when the bridge between the island and the main land will emerges (believe us : it will happen ! ), not only the whole East Coast of Koh Chang will be transformed, but also the whole Trat province. It will be a “game changer” and the people who will be owning lands in the area will see the value of their assets doubling, if not tripling, in a very short period of time. As the whole West Coast of the island is almost fully developed, the East Coast will mechanically know an economical boom in the coming years, so don’t wait too long to invest on the East Coast before it’s too late.